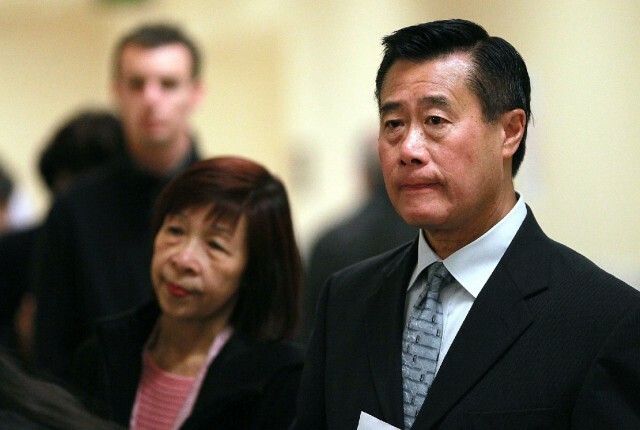 Federal prosecutors and lawyers for Leland Yee, the embattled state senator embroiled in a massive corruption case, are still negotiating terms of the politician's release pending trial. He is charged with accepting bribes and coordinating an arms trafficking scheme. Yee, 65, appeared briefly in federal court this morning, dressed in a suit and tie, The Associated Press reports. He smiled several times. The Democrat was ordered to return to court on April 8 to finalize bond. He is currently free on a $500,000 unsecured bond, but prosecutors want property he owns used as collateral to guarantee that he appears at all court hearings. He was arrested Wednesday as part of a massive five-year FBI sting operation. Yee, a longtime champion of good government and gun control -- whose district includes San Francisco and part of San Mateo County -- is one of 26 people, including former San Francisco school board president Keith Jackson, charged in a 137-page federal complaint. Charges include murder for hire, money laundering and drug-dealing. Yee's attorney, Paul DeMeester, said he expects a grand jury indictment next week, at which time he will enter a not guilty plea for his client. After the hearing, the lawyer told reporters, including KQED's Tara Siler, that the length of time the FBI devoted to the probe raised questions about the allocation of scarce federal resources and about fairness to Leland Yee and the public. Asked about entrapment as a defense, he said it's always something that has to be considered. Raymond "Shrimp Boy" Chow, a convicted felon and Chinatown gang leader who allegedly went straight, is also a major figure in the corruption case. He, too, appeared in court today -- shackled and in a jail-issued yellow jumpsuit -- with the expectation that he would be assigned a lawyer. That didn't happen -- he's still without legal counsel. He'll return to court on Wednesday, and Jackson will appear tomorrow. The state Senate voted Friday to suspend Yee and and two other Democratic members of the state Senate, who are at the center of high-profile criminal cases. A resolution to suspend Sens. Leland Yee, Ron Calderon and Roderick Wright, with pay, passed by a 28-1 vote.